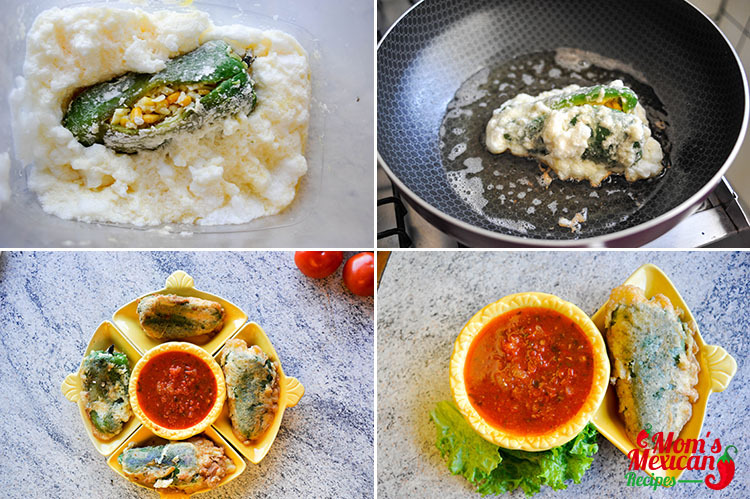 One perfect dish for a perfect afternoon is to make a Chiles Rellenos. 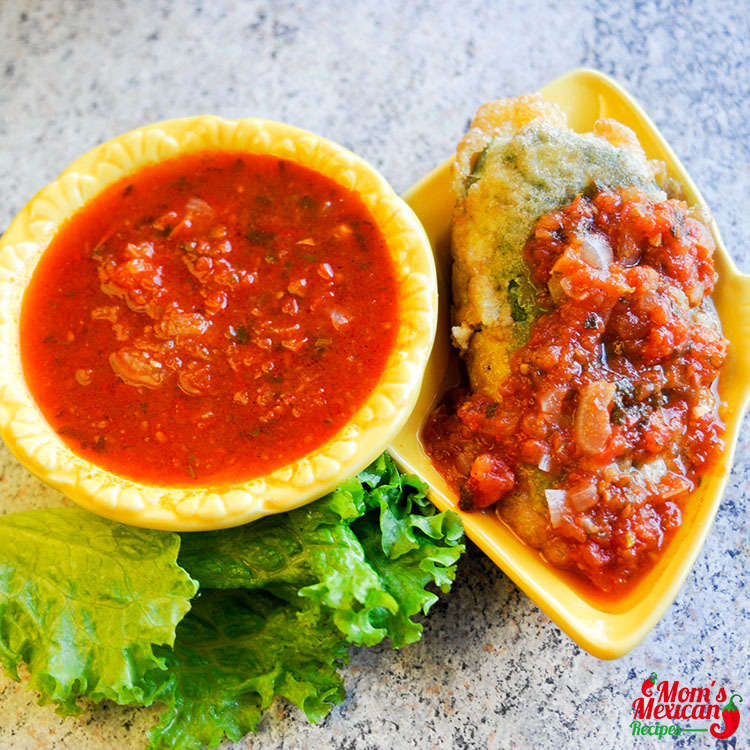 The Chiles Rellenos Recipe is a classic Mexican dish traditionally consisting of fresh, mild Poblano peppers stuffed with a savory filling. 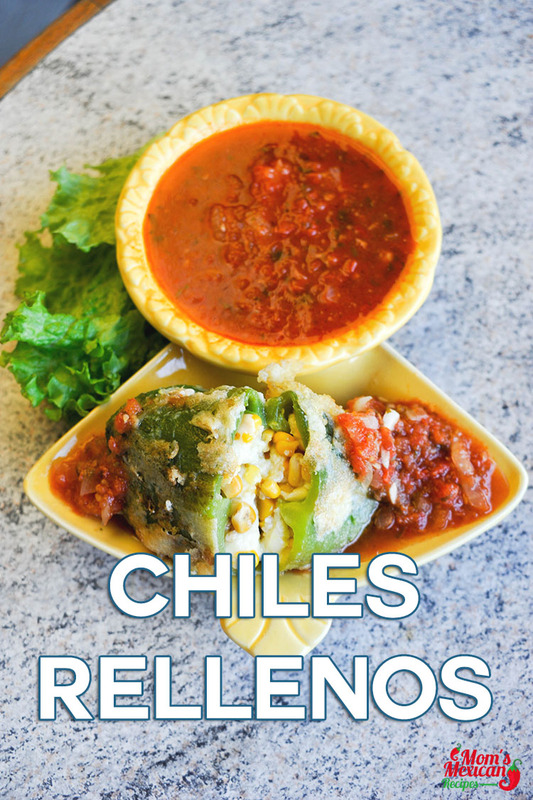 A dish that is originated from Pueblo, Mexico, where the Chile is roasted or fried and then filled with some good, dipped in a batter of your own choice. 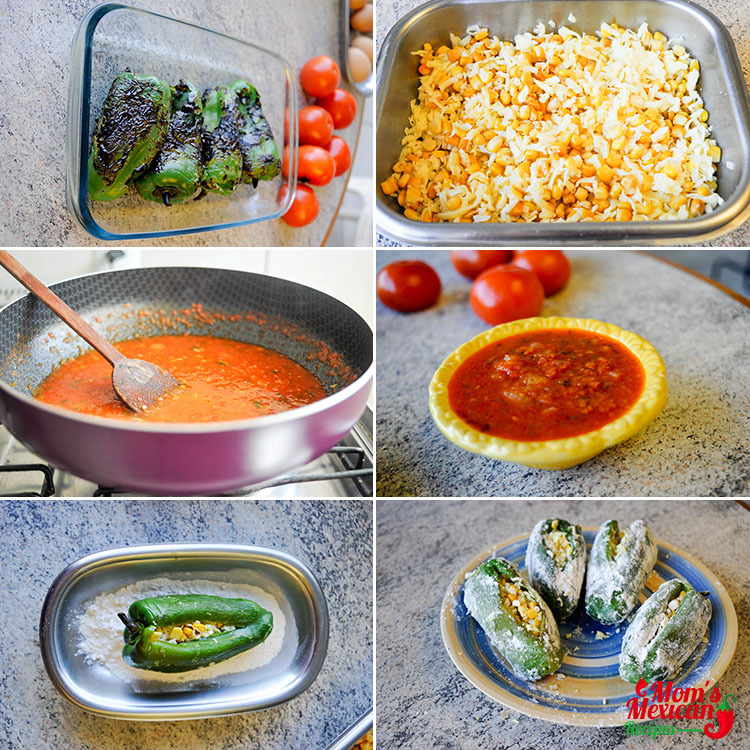 You can stuff the peppers with any variety of meat and vegetables but traditionally, Chiles Rellenos were stuffed with cheese and coat it in the egg batter or breaded and fried. Poblano peppers are quite large and a heart shaped, the skins are very thick making them perfect for stuffing like Rellenos. 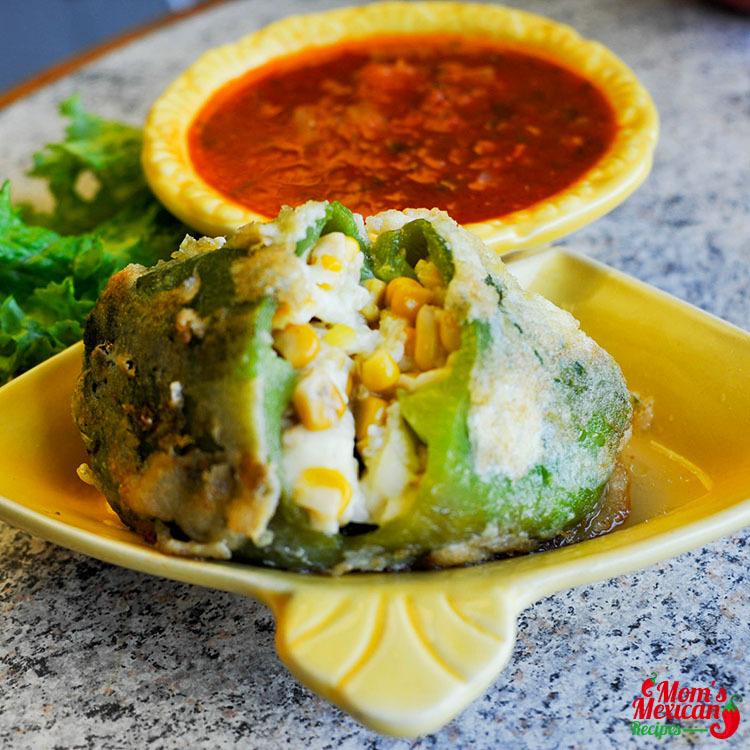 [See our Turkey Enchilada Stuffed Poblanos Rellenos and Mexican Stuffed Bell Peppers Recipe for more.] There are two different colors of poblano peppers, red and green. Red is hotter than green. Red give you a little more kick. And green is mild. You need to serve it immediately and topped with your favorite homemade sauce. First need to char the peppers. Turn a gas burner on high. Char the chiles on the burner grate, turning with tongs, until blackened all over, around 5-7 minutes. Or another way would be - char the peppers under the broiler. Gently rub the chiles with paper towels to remove as much skin as possible. In a medium bowl, use a hand mixer to beat the egg whites to stiff peaks. In a small bowl, mix 2 egg yolks with 1 tablespoon flour and ½ teaspoon salt. Place the remaining flour on a small plate. Mix one-third of the egg whites into the 2 egg yolks, and then gently fold the egg yolk mixture into the remaining egg whites just until incorporated. 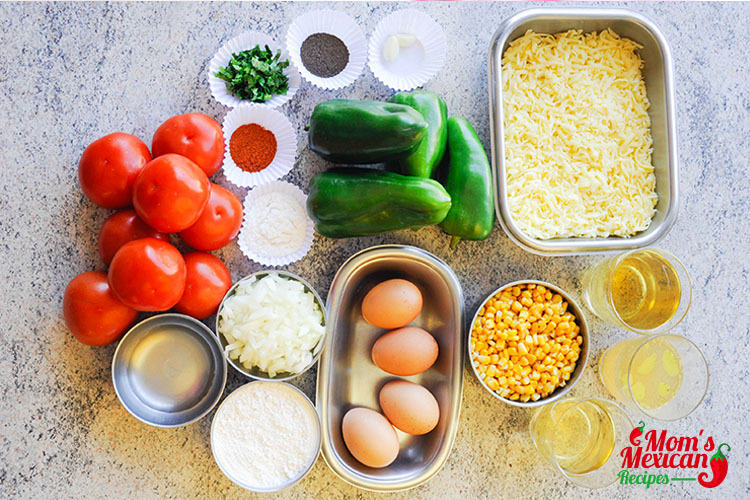 In a third bowl, mix together the cheese and corn. Remove seeds and membranes from peppers by slicing them open along one side. Slice about two-thirds the length of the pepper, just long enough to remove the seeds with a small spoon. Stuff the peppers with the cheese mixture, squeezing the cheese gently that it would stay together. Heat 1½ cup of oil in a large saucepan over medium-high heat. Gently roll the peppers in the flour. Coat the peppers in the egg batter by dunking and spooning the batter all around. Lift the pepper, and gently spoon off any excess batter hanging from the bottom. Place in the hot oil and fry until golden, about 3 minutes per side. Place on paper towels to absorb the excess oil. For serving Chile Relleno Tomato Sauce. Add the olive oil to a medium saute pan over medium heat. Then add the onions and cook until softened about 3-5 minutes, add the cayenne and garlic, and cook until fragrant, 1 minute longer. Add the chicken stock and the tomatoes with their juice and bring to a boil for 2 minutes. Remove from the heat and cool a few minutes. Mix in the blender, but the sauce will not be smooth. Add the cilantro, vinegar, salt, and pepper to taste.